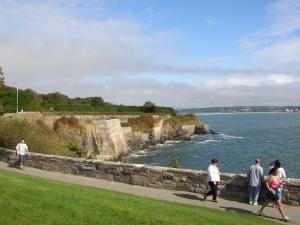 The Cliff walk Newport Rhode Island is a 3.5 mile trail along the beautiful South Shore. The hike begins at Memorial Blvd. and ends at Ledge Road off of Ocean Drive. Most of the walk is smooth, but parts (on the Southern half) are rocky and steep, so be prepared with proper footwear. The walk was designated a National Recreation Trail in 1975. 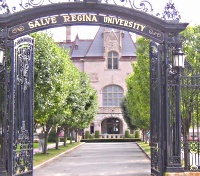 The Newport Cliff Walk goes past the gorgeous campus of Salve Regina University. This area between Narrangansett Ave and Ruggles Ave is very beautiful and my favorite, including a little further South to see The Breakers. It passes Ochre Court on SRU campus, a Gothic French Chateau and one of the most beautiful Mansions on the Cliff Walk. The "forty steps" at Narrangansett Avenue descends to a platform where it is said the servants from the Newport mansions use to spend their evenings dancing after a hard days work. Just South of the University is The Breakers, a gorgeous Italian "Palace" and the largest and most ornate of Mansions in Newport. Check out this website which has more details and history of the the famous Cliff Walk. Even if you only hike a small part of the Cliff Walk ...this, along with Ocean Drive, should not be missed on your things to do in newport on your Newport Rhode Island Vacation.